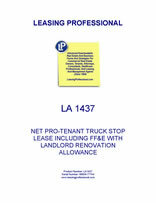 This lease form is designed for a transaction in which the landlord leases a truck stop facility to a tenant/operator. The lease includes the real estate as well as furniture, fixtures and equipment. The landlord also provides a renovation allowance for the tenant for this gasoline filling station operation. This Lease (“Lease”) is made as of _________________, by and between COMMERCIAL PROPERTY LANDLORD, INC., a __________________ corporation (“Landlord”), and TRUCK STOP TENANT, INC., a _________________ corporation (“Tenant”). SECTION 1.01 BASIC LEASE PROVISIONS. (a) Name and location of Premises: The ______________ Truck Stop, located at _____________________, situated on the real property described on Exhibit A attached hereto and made a part hereof, together with the buildings and all other improvements thereon. (b) Premises: The Premises consist of the real property (“Real Property”) described on Exhibit A, and are more particularly described in Section 2.01 hereof. (c) Initial Term: Ten (10) years. (d) Options to Extend Term: Two (2) renewal options of five (5) years each (each a "Renewal Term"), subject to the provisions of Section 2.02 hereof. (e) Rent: During the Term of this Lease, Rent shall be ______________________ and No/Dollars ($________) per year, payable in equal monthly installments of ______________ and No/100 Dollars ($________). If Tenant exercises Tenant’s First Option to Extend Term as provided in Section 2.02 hereof, Rent shall be ______________________ and No/Dollars ($________) per year, payable in equal monthly installments of ______________ and No/100 Dollars ($________). If Tenant exercises Tenant’s Second Option to Extend Term as provided in Section 2.02 hereof, Rent shall be ______________________ and No/Dollars ($________) per year, payable in equal monthly installments of ______________ and No/100 Dollars ($________). Exhibit A: Legal description and Plant of the Premises. Exhibit B: Underground Storage Tanks on the Premises. Exhibit C: List of Landlord’s Furniture, Fixtures, Tools and Equipment Contained in the Premises. Exhibit D: Encumbrances, Liens, Restrictions, and Easements. Exhibit E: Subordination, Attornment And Non-Disturbance Agreement. (a) Landlord leases to Tenant, and Tenant leases from Landlord, the Premises, including (i) all of Landlord's right, title and interest in and to the Real Property, the Buildings, and all other improvements thereon as shown on Exhibit A, and (ii) the underground storage and other tanks, the related islands, pumps, dispensers and other equipment (the "USTs") described on Exhibit B attached hereto and made a part hereof, and (iii) all easements, rights-of-way, rights of ingress and egress, and appurtenances thereto, and all parking areas used or useful in connection therewith, and (iv) all furniture, fixtures, trade fixtures, equipment, machinery, tools, and other personal property described in Exhibit C located on and used in connection with Premises (collectively, the "Premises"). (b) Upon Tenant paying Rent and performing all of the covenants and conditions set forth herein, Landlord hereby covenants and agrees that Tenant will peacefully and quietly have, hold and enjoy the Premises for the term herein provided. SECTION 2.02: COMMENCEMENT AND INITIAL TERM DATE. Possession of the Premises shall be delivered to Tenant on or before _________, 20___. The Initial Term of this Lease shall commence on the date Tenant accepts Landlord's tender of physical possession of the Premises (the "Commencement Date") and shall terminate ten (10) years thereafter. Landlord hereby grants to Tenant, in addition to the Initial Term, the option to renew this Lease for two (2) additional terms of five (5) years each (each a "Renewal Term"), subject to and on the same terms and conditions as herein provided. Each Renewal Term shall be exercised at the election of Tenant by the tender of written notice of Tenant's intention to extend the this Lease not less than thirty (30) days prior to the expiration of the Initial Term or the then current Renewal Term, as applicable. SECTION 2.03: MEMORANDUM OF LEASE. Each of the parties hereto agrees to promptly execute and record a Memorandum of Lease satisfactory in form to Landlord and Tenant. SECTION 2.04: EFFECTIVE DATE. Notwithstanding anything to the contrary contained herein, including without limitation that the Commencement Date shall be subsequent to the Effective Date of this Lease, it is the intention of Landlord and Tenant that this Lease be effective between the parties as of the Effective Date and that as of such date, that each of Landlord and Tenant have their respective rights and obligations hereunder. SECTION 3.01: QUALITY OF IMPROVEMENTS. As of the Commencement Date, the Premises shall include the Real Property, the Buildings and all other improvements and structures situated on the Real Property. Landlord hereby represents and warrants to Tenant that as of the Commencement Date, the Buildings and other improvements are in operating condition, order and repair, subject to ordinary wear and tear; that the HVAC, plumbing, electrical, mechanical and other component systems of the Premises and the Buildings are in operating condition, order and repair and capable of being used in the business as presently being conducted without present need for repair or replacement except in the ordinary course of business; that the Buildings and other improvements have been maintained and repaired in accordance with reasonable business practices, consistently applied and in accordance with the terms of all warranties and guarantees; the zoning classification of the Real Property is such that the Real Property may be used as it was used by Landlord immediately prior to the Effective Date of this Lease; the Premises do not, at the Commencement Date, violate in any material respect, any provisions of any applicable building code, fire, health or safety regulation, or other governmental ordinances, orders or regulations, and no condition exists as of the Commencement Date with respect to the Premises which would prevent, or require repair or modification thereof as a prerequisite to, Tenant using the Premises in the ordinary conduct of a full facility truck/auto travel center business, excluding conditions which require repair and maintenance in the ordinary course.